If you had a choice, which frequency band would you choose: VHF or 800 MHz? Over the past 40 years, new land-mobile radio (LMR) systems gradually have moved from VHF (150-174 MHz) to UHF (450-470 MHz), and more recently to 800 MHz. This progression from low to high frequencies is driven primarily by the availability of new spectrum, not superior physics, but many believe that 800 MHz performs better than VHF in real-world environments. The purpose of this article is to quantify the differences between VHF and 800 MHz and debunk some common myths regarding radio wave propagation in these bands. 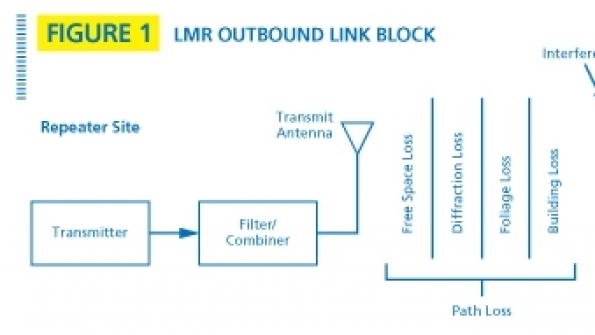 A block diagram of a notional LMR system is shown in Figure 1 for the outbound link (repeater site to user radio). To properly compare VHF to 800 MHz, we must identify all parts of the radio link that might affect the carrier-to-interference plus noise ratio, C/(N+I). These include transmitter power, filter and combiner losses, transmission line losses, transmit antenna gain, path losses, receive antenna gain, receiver sensitivity, interference, modulation, and error-control coding. Some of these parts are frequency dependent and others are not. Let’s start by eliminating those components that are not frequency dependent or can be altered easily to remove the frequency dependence. Transmitter power and licensed effective radiated power (ERP) are comparable between VHF and 800 MHz. True, the allowed ERP depends on the height above average terrain (HAAT) and location of co-channel and adjacent channel stations, but there is no universal rule that favors one frequency band over the other. The practical limitation often is the size of the transmit antenna. More on this later. Transmission line loss increases with frequency, but the system designer can increase the transmission line diameter to overcome losses. For example, a VHF station might use 7/8-inch diameter line while an 800 MHz station will use 15/8-inch diameter line. Similarly, filter losses increase somewhat with frequency, but there is no fundamental reason why duplexers and combiners cannot be designed with substantially the same loss in each frequency band. The receive sensitivity of VHF and 800 MHz radios is almost identical for the same airlink standard (e.g., Project 25). Advocates of 800 MHz sometimes will compare an existing analog VHF system to a new digital 800 MHz system, but this comparison hardly seems fair because digital radios are available from most manufacturers in both bands. In multipath fading, the difference between analog FM (12.5 kHz channel) and Project 25 is typically 5 dB. The fade rate is an increasing function of vehicle speed and radio frequency, and some error-control coding schemes are more sensitive to slow fading and vice-versa. A comparison of Project-25 error-control coding between frequency, bands is beyond the scope of this article. Another potential difference is site interference. VHF repeater sites are plagued by radio interference, but unlike the background noise in the low VHF band (25-50 MHz), this interference mostly is caused by other VHF radio systems or intermodulation products at the site. In most cases this interference can be corrected and, besides, there are plenty of sources of 800 MHz interference that are equally harmful. Thus far, VHF and 800 MHz are tied. The remaining two components, antennas and path losses, are highly frequency dependent. Now we will see some differences. The choice of antenna at the repeater site must take into account practical limitations as well as the need for close-in coverage. The wavelength at 150 MHz is two meters and rarely do we see antennas over 6 dBd, because higher gain antennas would be more than 8 meters long (25 feet) and impractical. Commercial antennas at 800 MHz are available up to 12 dBd, but the vertical beamwidth of such an antenna is only 3 degrees, making it a poor choice for close-in coverage. In rural, mountainous areas where the VHF/800 MHz battle often is waged, a gain of 9 dBd is more appropriate. Advantage: 800 MHz (by 3 dB). There are two types of user radio antennas to consider: mobile antennas and portable antennas. The typical mobile VHF antenna is a λ/4 monopole over a ground plane, resulting in a gain of 3 dBd. Mobile antennas for 800 MHz come in various types, but the most common ones also achieve a gain of 3 dBd. The key difference is height, with the VHF mobile antenna requiring a minimum of 50 centimeters (20 inches). The 800 MHz antenna can be smaller, but many employ an elevated feed, raising the overall height to roughly the same as the λ/4 VHF antenna. There is room on the vehicle rooftop, regardless, so height is not a problem. Advantage (mobile antenna): None. The portable antenna is a different story; here 800 MHz has a clear advantage. Twenty-inch-long λ/4 antennas on portable radios are impractical and we almost never see them. Besides, the monopole needs a good ground plane and the portable radio does not provide enough surface area to be effective. A λ/2 coaxial dipole would be a better choice from a performance point-of-view, but the antenna length is now 100 centimeters (40 inches). The practical choice for VHF is a helical antenna which resonates at a shorter length, at the cost of lower gain. Another factor in portable radio use is body loss. Some treat body loss as a path loss, but we will include it in the antenna gain, resulting in an effective antenna gain that includes the free space pattern of the antenna and the attenuation created by the human body. Body loss varies with radio height, position of the user’s extremities and orientation relative to the repeater site, so we only can talk in terms of mean or median body loss. Hill and Kneisel measured body loss for various types of antennas, portable height, and over several body orientations. For a helical VHF antenna with the portable radio at head height, the authors measured a median effective antenna gain of -11.3 dBd. In contrast, an 800 MHz coaxial dipole antenna measured a median effective gain of -4.5 dBd. Advantage (portable antenna): 800 MHz (by 6.8 dB). Foliage loss and building penetration loss often are treated together as clutter loss, but we want to treat building penetration loss separately because building geometries can favor certain frequencies. Free space loss is the minimum loss; the total path loss always is greater than free space loss. Free space loss is calculated using the formula in Equation 1. Because f=c/λ, where c is the speed of light (3×108 m/s), we see that free space loss increases as the square of frequency. In the case of 800 MHz and VHF, the difference in decibels is 20log10(850/150) = 15.1 dB. Advantage: VHF (by 15.1 dB). Diffraction losses occur when obstacles appear in the path between transmit and receive antennas. Fresnel diffraction theory tells us that to avoid diffraction loss, the clearance must be greater than 60% of the first Fresnel zone radius (F1) and we know that the Fresnel zone radius is a decreasing function of frequency. Thus, an obstacle located below the line-of-sight path might still create loss at 150 MHz, but not at 850 MHz, if the clearance is not sufficient for 0.6F1 at 150 MHz. However, when the obstacle is higher than the line-of-sight path, knife-edge diffraction theory applies, and diffraction loss becomes a strong function of frequency due to the electrical properties of the obstacle, geometry and surface roughness. This non line-of-sight diffraction loss generally increases with frequency. Advantage: VHF (variable). Most building materials, including concrete, wood, drywall and glass have lower loss at lower frequencies, but small apertures and slots favor the shorter wavelengths at 800 MHz. This property often is cited as an advantage of 800 MHz. Advantage: 800 MHz (variable, depends on building size and type). Measurements are welcome when available and we happen to have access to drive test measurements from three mountaintops in Colorado. The results are shown in Table 2. If we are talking about mobile users, or even portable users operating outdoors, VHF is the clear winner. This result is supported by both analysis and measurements, assuming the VHF radio operates with the same airlink standard as the 800 MHz radio and one is not subject to more interference than the other. In reality, 800 MHz penetrates many buildings better than VHF because the shorter wavelength slips through apertures and slots better than VHF. However, if the signal is weak before it gets to the building because of other path losses, VHF still will be stronger inside the building. Jay Jacobsmeyer is president of Pericle Communications Co., a consulting engineering firm located in Colorado Springs, Colo. He holds bachelor’s and master’s degrees in electrical engineering from Virginia Tech and Cornell University, respectively, and has more than 25 years experience as a radio-frequency engineer.